Product prices and availability are accurate as of 2019-04-05 21:03:46 EDT and are subject to change. Any price and availability information displayed on http://www.amazon.com/ at the time of purchase will apply to the purchase of this product. Producing quality, wide-format color laser prints (up to 11 by 17 inches), the HP 5550dn meets most everyday office and workgroup demands. Featuring HP ImageREt 3600 print technology, the 5550dn offers up to 27 ppm printing in black and color, with less than 16 seconds warm-up time. Versatile and expandible paper handling lets you add new trays as you need them; and with the 5550dn, automatic duplexing comes standard. The 5550dn has a powerful 533 MHz processor and offers 160 MB of memory (expandable to 544 MB) as well as two Flash Memory card slots. It features both parallel and USB (1.1) connectivity, plus an HP Jetdirect 620n Fast Ethernet internal print server, and two available EIO slots. 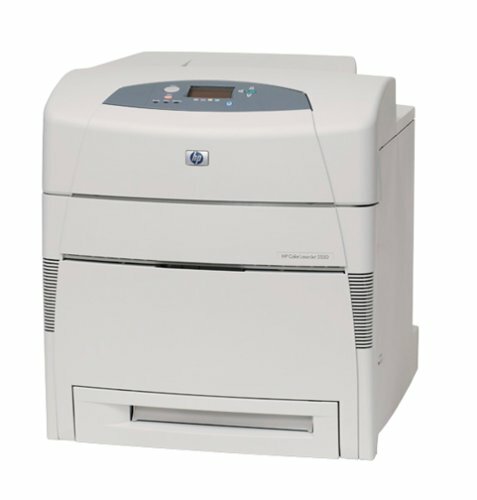 The HP 5550dn is backed by a one-year warranty.